Years ago, our favorite crystal brand produced some ‘useful’ items. Among the ‘funcational’ items that the company produced, a resourceful collector might find Swarovski Candleholders, Swarovski Clocks, Swarovski Treasure Boxes and Swarovski Magnifier figurines. But these are just a few of the releases that would be considered ‘functional’, there are many others. I find the Swarovski Magnifier releases to be more uncommon of the older figurines. There are two different types of magnifiers, and Swarovski produced both magnifiers with different metal trim. The Swarovski Table Magnifier was produced 1978 through 1983. I’ve seen a few of them, none of which have the official Swarovski logo on them. But based on the timeframe they were in production, it may be possible to see them with the Block SC logo on them. The Swarovski Table Magnifier is just over 3.5 long. It was produced with gold trim: Swarovski Gold Table Magnifier and silver trim: Swarovski Rhodium Table Magnifier. Both variations retailed for $70 during their production lifetime. 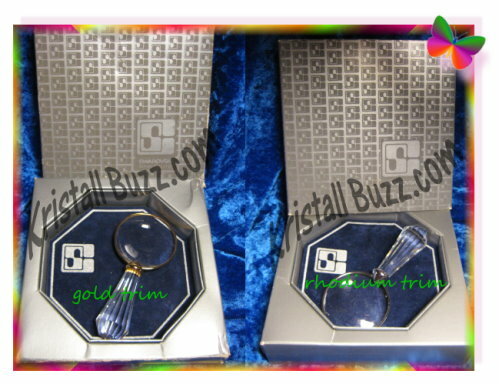 Crystal Exchange America recently sold the Swarovski Gold Table Magnifier and the selling price was $180. There is presently a Swarovski Rhodium Table Magnifier on ebay (item #140732123957 ), with an even lower opening bid! The luxury brand also made magnifiers with a chain attached to the handle. This other magnifier was also available with silver or gold trim. These magnifiers are known as the Swarovski Gold Chain Magnifier and Swarovski Rhodium Chain Magnifier. These chain magnifiers are about 3.75 inches in length. The Swarovski Block SC may be stamped into the metal, or they may not have logos at all on them. Little information is known about the introduction dates or original MSRP. 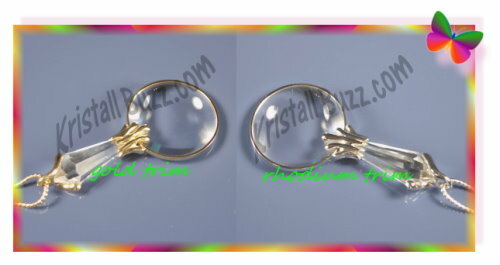 The Swarovski Chain Magnifiers were retired in 1984. I found a couple of incomplete transactions on ebay, so I am concluding that the opening bids of < $250 was more than any Swarovski collector was willing to pay, which does surprise me. I don’t honestly know if anyone ‘uses’ the Swarovski magnifiers. But it might be nice to have a reason to buy one….you ‘needed a magnifying glass’ for reading or inspecting Swarovski crystal! In my television area, a local tv station has a segment called “Don’t Waste Your Money” by John Matarese. Daily, his segments feature money-saving tips, warnings, and other interesting articles. Well, today, I feel like following in his shoes, discussing Discount Swarovski Crystal. Times are tough….a lot of jobless families, the high cost of gas, and how gas prices trickle into all areas of our lives. Since Swarovski is definitely not a necessity, many Swarovski crystal fanatics have lowered their annual spending on this luxury commodity. Even the values of retired Swarovski has been on a downward trend for a number of years. No one should ever purchase Swarovski crystal strictly for investment reasons, as those days are long behind us. Since collectors are likely spending less on Swarovski, picking the most important figurines at the best possible prices has become more important than ever to maximize crystal satisfaction. 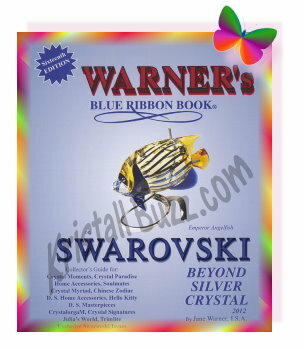 Thank goodness for stores and websites that offer savings to Swarovski collectors! There are lots of authorized Swarovski retailers that offer sales and coupons to help keep collectors happy and spending money on Swarovski. And there are lots of sellers / dealers on ebay able to pass along savings to collectors. This is all good, right? It seems that the crystal giant is getting very upset with dealers and websites that are selling Swarovski figurines and Swarovski jewelry at prices that are below the crystal brand’s prices on their own web site. Well, of course it would be a distraction to the brand for consumers to purchase from these other stores and web sites versus spending more money at Swarovski.com, but honestly, I don’t see the big deal. Swarovski has already sold their figurines and jewelry at their wholesale cost to a pre-selected, authorized business, WHY are they so distressed that these other businesses are willing to operate on a lower commission / less profit, to keep the figurines selling, still putting money in their own pocket? And now, it appears that Swarovski is even striking back at the very crystal collectors who enjoy purchasing and displaying Swarovski figurines! How so? 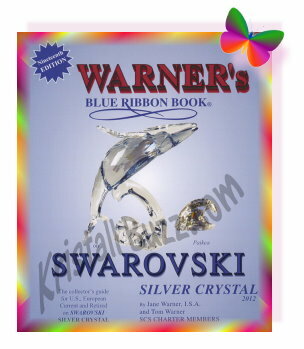 According to articles on the internet, the company no longer wants to honor their own Swarovski Warranty UNLESS the figurines were purchased directly from the offline store or from their own web site. Unless a consumer can provide a warranty card, and sales slip from an authorized retailer, which shows both purchase date and price, they will not offer after-sales-services any longer. This could prove quite tricky for people who receive the items as gifts and either never had a sales slip, or are not comfortable asking the gift-giver for such documentation. So what are collectors to do? Swarovski crystal collectors (and those who enjoy wearing Swarovski jewelry) need to make a conscious and careful decision on how important the warranty is for each purchase. Perhaps the cost-savings is the most important factor with every purchase, and you wish to give up the Swarovski warranty benefits. Others may feel that on more expensive purchases, that paying full price may be perceived as an ‘insurance’ policy and plan to pay full price for that warranty benefit. I certainly don’t agree with what is transpiring. I feel that collectors and consumers will eventually stop buying Swarovski if the prices are more than they can afford or are willing to spend. I don’t think the ‘price-fixing’ is going to entice their devoted customer base to keep on buying. Loyal collectors are going to have to decide what makes the most sense for them…full price with a Swarovski warranty or discounted Swarovski without any warranty. And as John Matarese says, “As always, don’t waste your money”. Swarovski and Clock collectors may be pleased to hear about a retired Swarovski Clock on ebay with an appealing opening bid! The clock on ebay is the Swarovski Providence Table Clock (ebay item # 140729693062). The Swarovski Providence Clock was designed by Steven Weinberg. This table clock stands about 7” tall. Swarovski assigned 9280 000 037 as the official part number and 235 432 as the official system number. Our favorite crystal company produced this clock from 1998 through 2003. During the 5 year production run, the Swarovski Providence Table Clock retailed for $850. 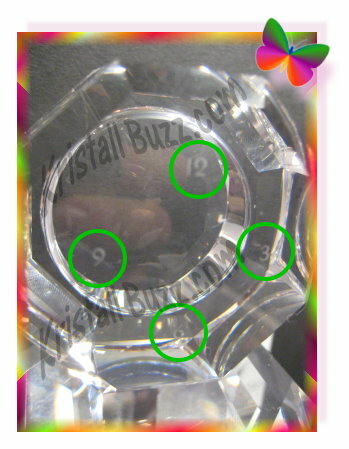 Some of the clock units had edition numbers laser etched in the crystal on the back side. I even discovered something new while I was writing this article…there are clock numbers on the back side of where the clock face is set in (3, 6, 9, and 12 o’clock only, with dots representing other numeric positions)! Now, nearly 10 years after retirement, the Swarovski Providence Clock generally sells in the $175 to $300 price range. 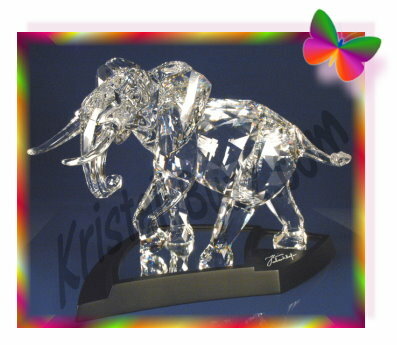 The crystal giant sold a number of Swarovski Clock figurines, which are featured in a Kristall Buzz post from September, 2011. Be sure to check out the article for more information about the nearly 20 clocks available over the years. 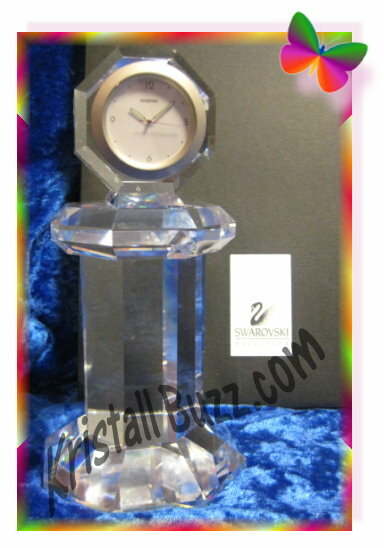 If you are looking for retired Swarovski Clocks, Crystal Exchange America has a variety available. The Crystal Exchange America web site is at www.CrystalExchange.com The clocks can be found in the category ‘Other Silver Crystal’, sub-category ‘Clocks’. Swarovski Aura Perfume Available in USA! Early in 2011 I posted an article about the crystal brand officially launching Swarovski Aura Perfume. It seemed like each time I tried to locate a purchasing source, I could only find them in the European market. Perhaps it was FDA approval delay or issues with importing, who only knows. In any case, today, I received an email from Swarovski announcing that the Swarovski Aura Perfume is stocked in some Swarovski Boutiques here in the USA! In the email, there is a coupon to receive a complimentary “mini spray” of Aura by Swarovski. The coupon is valid April 1 thru 15, 2012 in participating stores. If you are a Swarovski fanatic and are interested in visiting a Swarovski Boutique for more information, the Swarovski Beauty website has a link to locate the various “points of sale” for Aura by Swarovski. Simply select a city from the predefined list, and stores in that area will display with phone numbers and physical addresses. The Swarovski Beauty web site also contains an Interview with Markus Langes-Swarovski, Swarovski Crystal Board of Directors about the conception and future of the Aura Perfume by Swarovski. The Kristall Buzz contains several posts over the past year about the Swarovski Aura, so enjoy reading them for more information! Swarovski has previously worked together with other companies to put other scents in luxury bottles, such as Tresor, Yves St Laurent, Jewel, Roma, and Madame Gres. Happy St Patrick’s Day to all Swarovski Crystal Fanatics! St Patrick’s Day is definitely known as the day of the green. For kids, they must wear green or suffer through the consequences of a pinch. For the older crowd, many indulge in a green beer at the local pub / eatery. It’s all about green! Swarovski collectors can display their crystal in support of the green day by displaying green Swarovski figurines on St Patrick’s Day. 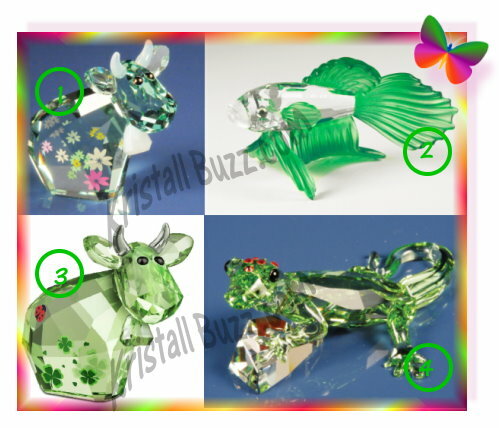 Just to name a few….below is a list of four Swarovski green crystal figurines in the Silver Crystal and Lovlots product lines. #2 – Swarovski Green Siamese Fighting Fish. The Swarovski Siamese Fighting Fish (Green) was designed by Heinz Tabertshofer and produced 2000 – 2004. It was a part of the “South Sea” theme group. The Siamese Fighting fish was also produced in blue and in red. #4 – Swarovski SCS Gecko. The Swarovski Gecko was designed by Heinz Tabertshofer and was available only in 2008 to SCS members at special Swarovski events. #1 – Swarovski Flower Mo. The Swarovski Flower Mo was designed Edith Mair and available only in 2009. This Limited Edition Flower Mo is green period, decorated with tiny flower decals. 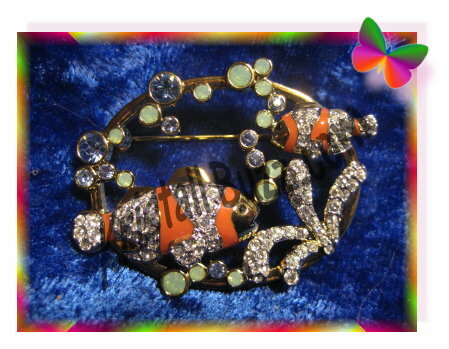 #3 – Swarovski Lucky Mo. The Swarovski Flower Mo was designed Edith Mair and available only in 2009. Swarovski Lucky Mo is green period, decorated with tiny four-leaf clover decals and a cute ladybug near the back-end. This Limited Edition Lovlots Lucky Mo is available in 2011 while supplies last for $65. So to all the younger ones…wear your green. To all Swarovski crystal fanatics…. display your green! And to many others, find some lime kool aid (or any other green beverage), and drink your green. Just last week, Crystal Exchange America sold a Swarovski HTF crystal figurine….. the Swarovski Painter’s Palette. This unique item sold for $100, a price significantly higher than the original MSRP at the time of retirement. The crystal artist palette is a cute item. The palette is clear crystal with 7 different colored stones to represent various colors of paint. The paint splotches are red, green, blue, yellow, pink and clear (for white). The palette contains the Swarovski swan logo on the back side. 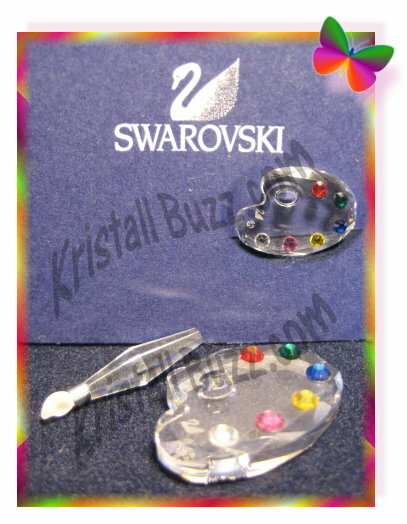 Included with the Swarovski Artist Palette is a separate figurine for the Swarovski Paintbrush. 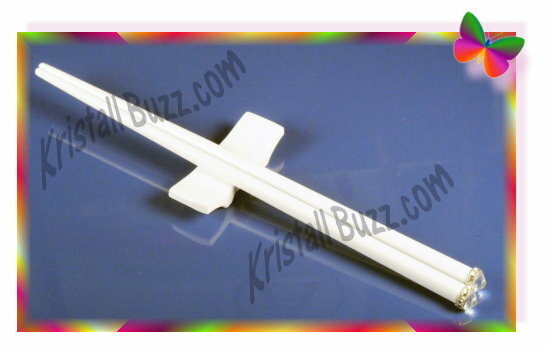 This part has a clear handle and a frosted component for the brush bristles. The paint brush does not contain any logo. The Swarovski Painter’s Palette was produced by the crystal brand for a relatively short period of time: 2005 to 2006. The figure was designed by Keiko Arai. The Swarovski identification #’s for the Painter’s Palette are 9460 000 179 and 680 850. The crystal figurine’s MSRP was $35 during the production years. This artist palette was a part of the “First Steps” theme group, which is in the Swarovski Crystal Moments product line. Another well-known creation by Keiko Arai is the 2011 Christmas Ornament. This Swarovski designer is also credited with about 35 other designs from 2004 through 2012. 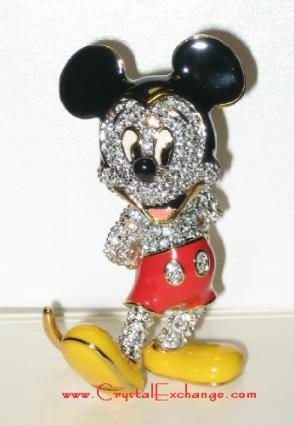 Crystal Exchange America has many retired figurines from the Swarovski Crystal Moments product line available. They can be found in their online store in the Crystal Moments category by navigating in the menu on the left side of the screen.